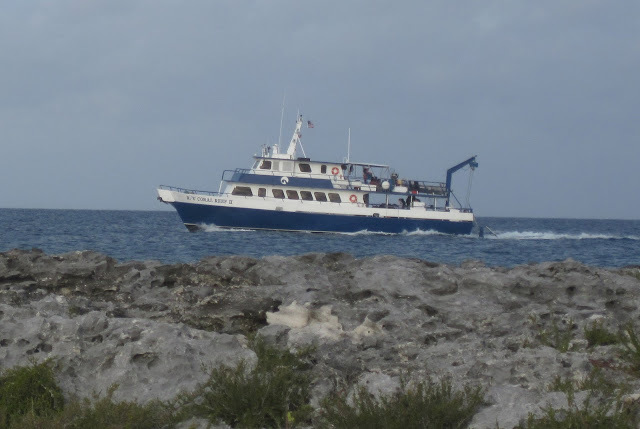 Posts from the Sea TURTLE teen diving program will continue, but at the same time New England Aquarium staff and volunteers are their regular spring expedition to the Bahamas. This is that team's first post, written by Andrea. After spending two hours sitting on the plane in Boston before it finally took off, I am happy to report that the Aquarium staff arrived at the Coral Reef ready to start the Spring 2011 Bahamas Collection Trip. New England Aquarium staffers Deana, Dan, Barbara and Kate getting the rental car after finally arriving in Miami. Even though we are not setting sail until Friday there is a lot that needs to get done to prepare the boat for the trip. The wells which will house the fish we catch needed to be scrubbed down. The gravel in the filters needed to be dumped and replaced with fresh gravel. We are climbing in tanks and working in the “lazerette”, which is a compartment underneath the front of the boat where the life support system is housed. It is hard, dirty work but no one is complaining because pretty soon we are going to be in the Bahamas collecting beautiful fish. It also doesn’t hurt that it is sunny and 85 degrees out, and we heard it might snow this week in Boston (sorry everybody). We even had a visit from a friend. Jacki, who participated in last year’s SEA TURTLE program and who is now going to the University of Miami, stopped by to say hi and help us out. She helped us make catch bag by sewing vinyl bags to the bottom of modified Tupperware sandwich containers. To read about Jacki’s adventures on the Coral Reef last year and to follow this year’s SEA TURTLE teens click here. We have some interesting neighbors here at Jones Boat Yard. There is a cargo ship loading various items to be sent to Haiti. Our other neighbor is the Iroquois which belongs to Red Sox owner John Henry. The Iroquois is also our neighbor back in Boston too, as it is often berthed at Rowes Wharf just minutes away from the Aquarium during the summer. Well it’s off to bed to rest up for another day as we continue to get the boat ready. Read more of Andrea's posts on the Aquarium's penguin blog. Tonight, Detective Robert M. Zingg of the Boston Police Department came to talk to us about his work and the kind of opportunities out there after becoming SCUBA certified. Det. Zingg was born and raised in South Boston and started working for Boston in 1983. In 1991 Det. Zingg entered the Boston Police Academy where he underwent intensive training. He told us that it is so hard, that a lot of people drop out. Currently Det. Zingg is working plain clothes patrol, the gang unit, and the drug control unit. He is a detective in Area B3 which is in the Mattapan, Dorchester area and is responsible for getting finger prints and collecting physical evidence. But, what happens when there is very little physical evidence? They have something called the Locard's Exchange Principle Theory. This means that anytime a person comes into contact with anything, it leaves evidence on them, which then gets transferred on to the victim. 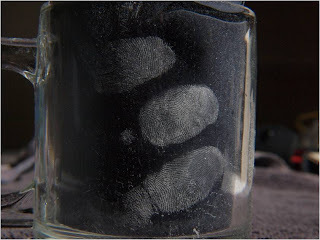 Sometimes, the only evidence police detectives have are dust, dirt, rug fibers and fingerprints. Det. 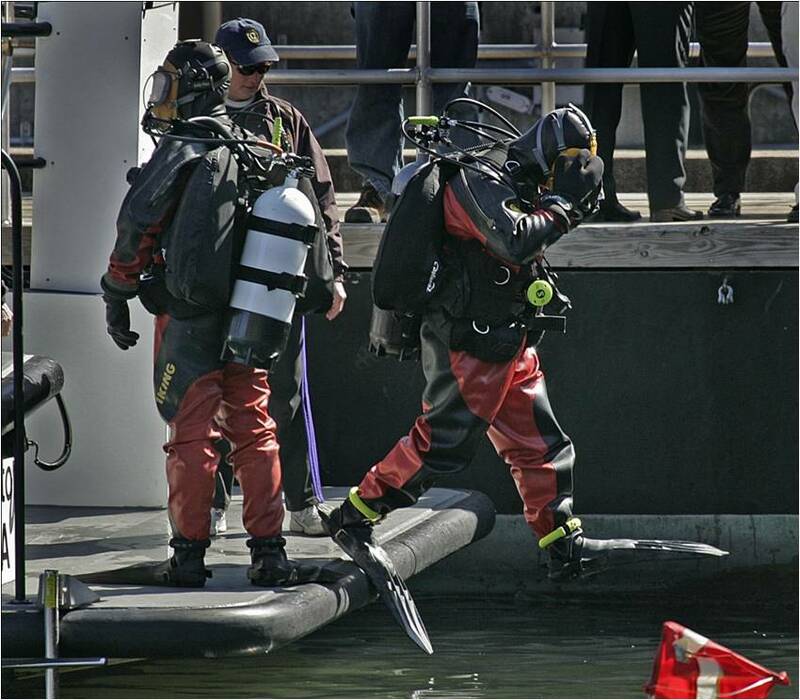 Zingg is also a member of the Boston Police Underwater Recovery Unit. 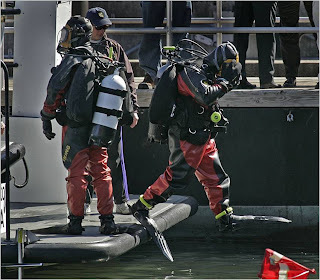 That job entails the search of bodies in and around the city of Boston, recovery of items as evidence, and the underwater inspections of marine structures, vessels and military assets. The best advice that Det. Zingg had for us, as new divers, was to look for opportunities. "You can always find something to do. The more diving you do, the better you get." Thank you for taking time out of your very busy schedule to come and talk to you Det. Zingg! We learned so much and it opened our eyes to the opportunities we will have in the future. We had our first pool session at MIT! We got our wetsuits and fins and then learned how to set up our buoyancy control devices and air cylinders. The weight of all the gear surprised me, and I couldn't wait to get into the water. Senior Aquarist Bill Murphy volunteered his time to help out in the pool while Denise shows off her weight belt! For almost all of us, this was our first time breathing underwater, and the experience was thrilling. We practiced some of the skills we need for certification, such as breathing with our buddy's regulator and clearing our masks. After a short lunch break, we were back in the water learning and practicing more new skills. My name is Lulu and I am a senior at Cambridge Rindge and Latin School. I first started working at the New England Aquarium in the summer of 2010 as a teen intern in the Visitor Education department. While working there I was able to learn all about the different galleries and interpret them to visitors. I also had the opportunity to lead live animal presentations with epaulette shark pups and question and answer sessions at the top of the Giant Ocean Tank! 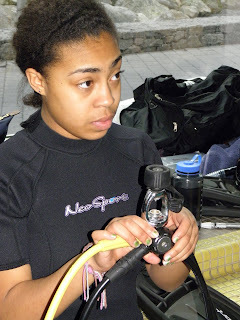 I continued to work during the school year in the Dive department with three other teen interns. Working in the dive department has been another chance for me to learn more about the aquarium, especially about the Giant Ocean Tank. My supervisors are very supportive and encourage as much learning as possible when it comes to the actual marine biology in the tank. One of the requirements for applying to this program was having a general interest in marine biology. That is one of my favorite aspects of the trip because I have been slowly working my way into becoming a marine biologist. I have been doing this by tanking ecology, marine science and oceanography classes. I also have a marine science internship class this year. With my internship class I am studying Cnidarians (jellies, sea anemones, and coral polyps) with Dr. John H. Costello of Providence College. However, there is so much more to learn in the Sea TURTLE program. 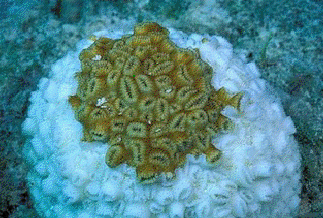 I can't wait until we go out do some researchof our own in the Bahamas! Hello world, Sea TURTLE II Member: Lee, reporting! I am a veteran teen intern at the New England Aquarium. I started in October 2008 in the Visitor Education department speaking to visitors and delivering presentations. I transitioned into the Community Programs department to work more closely with tide pool animals and traveling with them to educate children at schools and YMCA's about them. Finally, I landed in the Teen Programs office where I currently assist in filing, data entry, and organizing events for our teen social events. I assist behind the scenes from time to time, too; I get the all around experience! I am so excited about this entire experience; I apologize for being a little eccentric! I still have a hard time believing that I'm going to be scuba diving in the Bahamas in just a little over a month! The road to get here has been long and arduous... Group interview (Josh mentioned those group interviews here), individual interview, SWIMMING, pressure, class time, did I mention swimming? The swim test to ensure our safety and comfort level in the water is a whopping 4 laps and a 10 minute tread. No breaks, no touching the walls in the tread. That's scary. On the day of the swim test, Michelle and Lulu volunteered to go first. They are amazing swim team swimmers. The bar was high, despite the test not being a race. Watching them made me extremely nervous for my own turn. Who would go next? Jessica volunteered us both because she KNEW I could do it; there was no doubt about it. I swallowed all my fear and got into the pool. I wasn't sure I would have the stamina for the four continuous laps. When I reached the wall of the deep end for the last time, I couldn't even believe that I was done! Next was the ten minute water tread. There were a few times I let my fears race for a split second through my head but I was so close to finishing the swim test, I wasn't about to let a little water sink me! Every once in a while, I would catch a glimpse of Jenna and Sarah telling me I could do it and to keep going. When I heard Michelle and Jessica tugging me to tell me I was done, I couldn't believe it at all! And now it's onto the actual scuba stuff, I can't wait to see what else adventures and challenges Sea TURTLE brings me next. With the team and the program, I'm sure everything from here on will be fun and exciting! Hi! My name is Christian and I am a junior at Newton South High School. I am also an Aquarium guide volunteer as well as a member of the Sea TURTLE 2011 team. Every Sea TURTLE class is always exciting one, and it holds new opportunities to learn from guest speakers to group activities. Christian and Libna sharing their "Eco-Confessions." Last class we shared our eco-confessions, this is a confession that involves a problem dealing with the environment. We talked with our group members about what we do in our every day lives that might have an impact on our oceans and marine life. Our confessions ranged from driving to work every day, taking long showers to leaving on electronics. 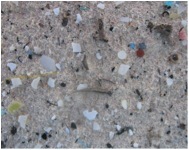 We all had ideas on what negative impacts these things may on the environment and how they damage our oceans. For every problem that was discussed in the class, we came up with a solution like taking shorter showers, riding a bike to work or even turning off all your electronics when were out of the house or just not using them. Even though all of us are trying our best to protect the blue planet, it just isn't enough. My hopes are that people reading the Sea TURTLE blog posts will see the on going problems and try to help protect our oceans as well. Here are some other ways for people to Live Blue. 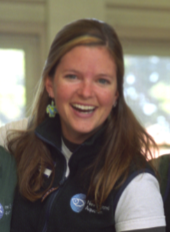 My name is Michelle and I am a teen intern at the New England Aquarium. I currently work behind the scenes in the Wet Lab and I take care of the Edge of the Sea touch tank. I've been working at the Aquarium for about two and a half years now and it's been amazing. 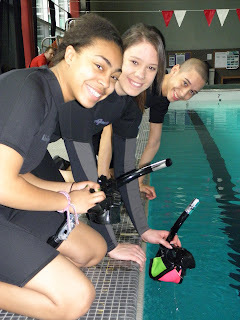 I get to work with animals, divers, aquarists, and amazing teens from all around Boston! In action at the Edge of the Sea exhibit. What's even better is being able to become a bigger part of this community. Now, all I can say is WOW! I will be learning how to SCUBA DIVE. Me? Really? I'm a Sea TURTLE? I couldn't believe it but I made it. I don't think I can even tell anybody how many times I've read the acceptance email just to make sure I wasn't dreaming. I felt like running down the streets of Boston screaming in joy! The one person I definitely needed to tell was Jane from last year's Sea TURTLE trip. Jane has been my role model ever since I met her and she's been inspiring me to do great things (like Sea TURTLE!). I wish I went on the trip last year with her so that we could share the amazing experience together but now, it's my turn! Lee, Michelle and Jess after their successful swim tests! So far, the girls aced the swim test with flying colors. The test consisted of swimming four laps and treading for 10 minutes without touching the wall. All of that in one go can be pretty tiring and I must say that we all did great! It was fun to cheer everybody on and see the victory in everyone's faces. The swim test gave the team some time to bond and now we must keep one goal in mind: We must not get sick! Eek! My Name is Libna and I am a Sea TURTLE team member and this is my first blog! Last week in class, Jenna started us off with a fun group exercise, a way for us all to get close (physically) since we're going to be on a boat together for ten days. I think were going to get along just fine. All eleven of us had to stand on this small platform at the same time! Tonight our guest speaker was Dr. John Mandelman. He has been at the New England Aquarium for ten years as researcher. His specialty is in elasmobranchs (sharks, rays and skates) and how they get stressed out when they are caught by hooks and nets. Animals that are accidently caught when fishing are called bycatch. One thing Dr. Mandelman told us was that when sharks and other fish feel threatened, they just keep swimming until their bodies shut down or they die. For some reason, they don't realize that they are tired like humans do. This is a huge problem because sharks are part of healthy oceans. Unfortunately, there are many species of sharks that are threatened or endangered because of bycatch or people catching them for their fins (see this recent post from Fiji on the Global Explorers Blog). One of the ways that the New England Aquarium helps sharks in the wild is by educating people about them. Make sure to check out The Trust Family Foundation Shark and Ray Touch Tank opening this April! With the Bahamas slowing approaching, excitement is rising; our brains are overflowing with information of diving and information about the Bahamas. Things are going well. My name is Jessica and I'm the newest Sea TURTLE. 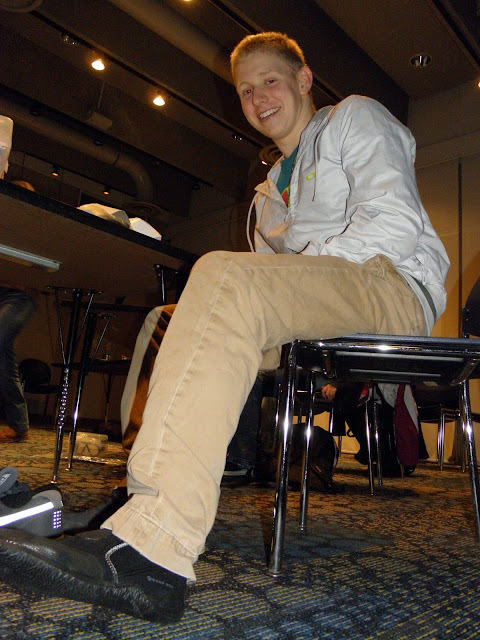 I'm a senior at Boston Latin Academy and a Teen Intern at the New England Aquarium. I work mostly with Community Programs. We pack up live tidepool animals (like the ones you may have seen in our Edge of the Sea exhibit) and bring them to kids in libraries, after school activities and other special events! Showing off some of our local tidepool animals! When I first told my parents I was applying to this program, they weren't as ecstatic as I was... not that I blame them. The idea of sending your child to another country would probably make any parent a little hesitant. But I applied anyway because I thought this opportunity was too good to pass up. I really wanted to do it! So when I heard I was accepted I made this sound that would probably be impossible and too embarrassing to type out. Since I joined the Sea TURTLE program a few weeks later than everyone else, I didn't get to go to the family orientation. So when I was accepted, Sarah had to meet with my parents so they could catch up on what they missed. They talked about the entire program and how important safety is to Sarah and the whole Sea TURTLE team. When my parents left the meeting, I could tell they were a little more at ease. If you're thinking about applying next year (the Sea TURTLE II team is working hard to keep the program going!) don't let this opportunity slip away! If you're really willing to work hard for it, everything else will slip into place. I'm glad it did for me! I am so excited to be apart of this team! Thanks, Mom and Dad! And thank you, Sea TURTLE! My name is Dina, and I'm currently a teen intern in the Dive Department at the New England Aquarium. I will be heading off to college in the fall to study marine biology and what better way to end my senior year than living on a research vessel and scuba diving in the Bahamas during April vacation? Although I am already scuba certified, I've only been on a couple dives and I'm excited to review the skills I have learned with the 10 other students. Words cannot even begin to describe how grateful I am to be apart of the Sea TURTLE II team. I'm positive this is going to be an experience of a lifetime. Looking down on our own Caribbean coral reef in the Giant Ocean Tank. This week in class we each discussed our "eco-confessions." Dave had given us the assignment to think of something that we do in our daily lives that isn't healthy for the environment. Some of the topics that came up the most were things like using cars more often than necessary and showering for long periods of time. We also talked about ocean issues that affect the Bahamas, such as ocean acidification, invasive species, overfishing, pollution and habitat loss. We are more connected to places like the Bahamas then we think! After discussing these eco-confessions, it made me realize how influential humans are on the environment. Everyone has a not so environmentally friendly habit that they're guilty of, but if we can at least try to break out of our bad habits it can make all the difference for the environment. Dina and Porshai testing out some new dive gear! Our first pool session is next week and I'm really excited to gear up and get in the water. I can't wait to take that giant stride off the side of the pool and get use to the feeling of breathing underwater again! My name is Denise and I got involved with the Sea TURTLE through a program called "Dive Kulture." I met last year's Sea TURTLES while working at the MIT pool distributing scuba gear. I'm honored to be part of this program and working with other people who love the ocean as much as I do. I've met some great instructors and reached a higher potential and a greater sense of the world. Denise and Josh with their Sea TURTLE game faces on. Tonight was our first Sea TURTLE class session together as a group! With the help of Sunnye, who organizes the Aquarium Lecture Series, we learned lots about the history, culture and conservation of the Bahamas. I have to admit I learned so much about Bahamas that I wish I would have visited there a long time ago. 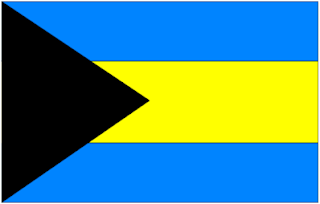 The Bahamian flag! Tonight we learned that the black represents the strength of the people, the blue is for the waters of the Caribbean and the yellow is the sandy beaches! Sunnye made things so much easier to understand by giving us a little head start on what we will be experiencing in Bahamas. We learned that we need to always be respectful when visiting other cultures. One thing that I always found interesting was when Sunnye told us that the first people to live in the Bahamas were called the "Lucayans." Her lecture really made me realize I got a lot of learning to do. Another favorite from her slideshow was when she told us about "Junkanoo." 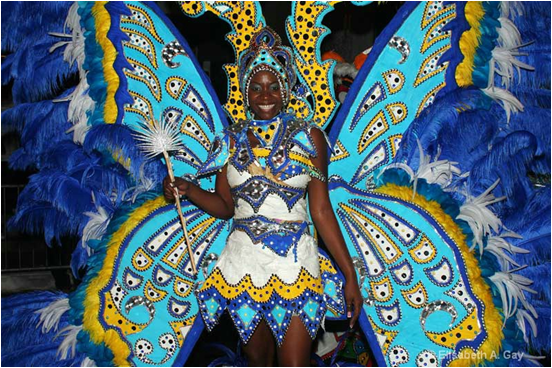 For those who don't know, Junkanoo is an annual Bahamian celebration involving masks, costumes, cowbells, whistles and drums. It also includes lots of delicious food! I found it pretty interesting that I haven't learned about this culture in school. 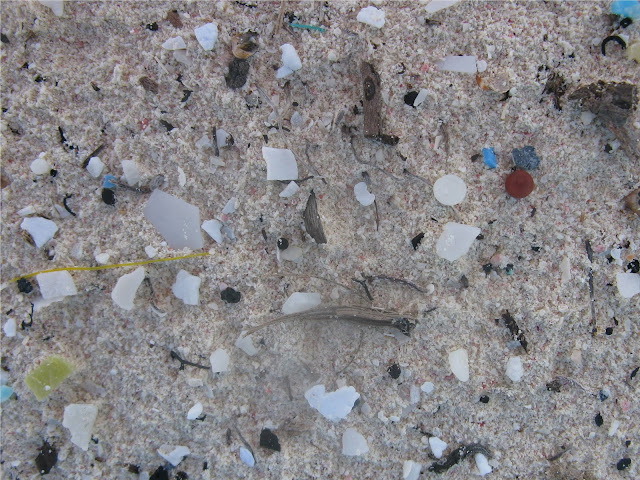 Sunnye also talked about plastic pollution in the Bahamas and showed us her "nurdles." Nurdles are small beads of plastic that wash up on pretty much every beach in the world or accidentally get eaten by animals. We really appreciate all the information that we learned in class tonight. Thank you, Sunnye!